Apple's Magic Trackpad isn't the first of its kind -- in fact, Wacom has been playing this game for awhile -- but it's the first of its kind from the cats in Cupertino, so obviously people take notice. 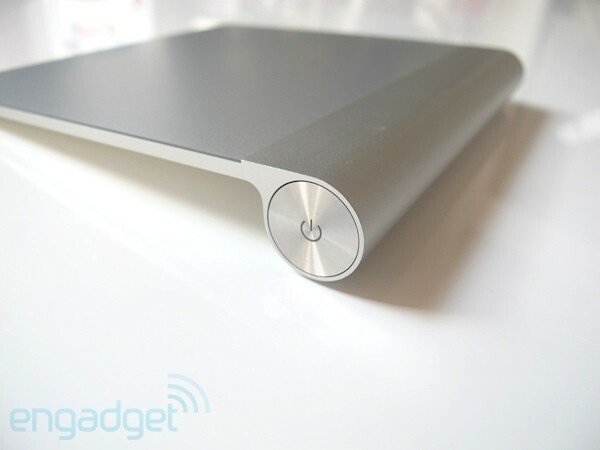 The premise of such a device is stupidly simple: it's a laptop trackpad that lives on your desktop. Over the past few years, there have been rumors that Steve Jobs has his sights set on eliminating buttons from Apple products altogether, and this certainly feels like the next step in the plan. But does it make sense? Is this an improvement over standard input devices like a mouse or trackball? More importantly, in the age of iPads and netbooks, does anyone even need an external input device like this? We're going to try and answer those questions (and more), so read on for our full review! 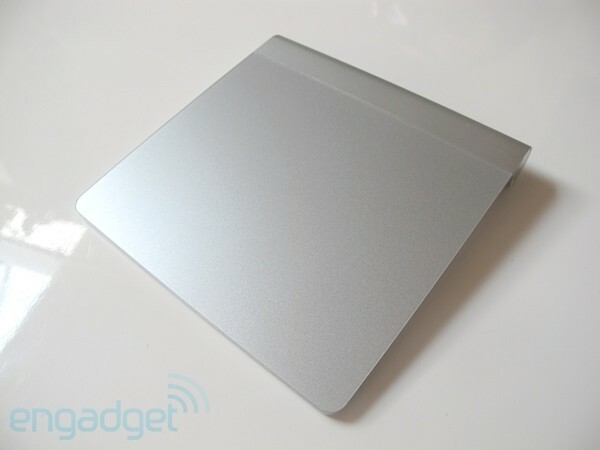 The Magic Trackpad isn't much to look at. That is, there just isn't much to it from a design perspective. If you've seen the standard Apple Bluetooth keyboard, then you should have a pretty good idea of what this device looks like. As with the keyboard, it's built out of smooth, soft, machined aluminum, with a curved back that gives the device some lift in the rear. The surface of the pad is... well, just pad. The front face is the same smooth glass that you've come to know on the MacBook and MacBook Pro trackpads, and just as with the newest generation of those laptops, the Magic Trackpad provides a single clickable button -- its entire tracking area. As usual, the construction of the device feels rock solid, and it's certainly handsome to look at. 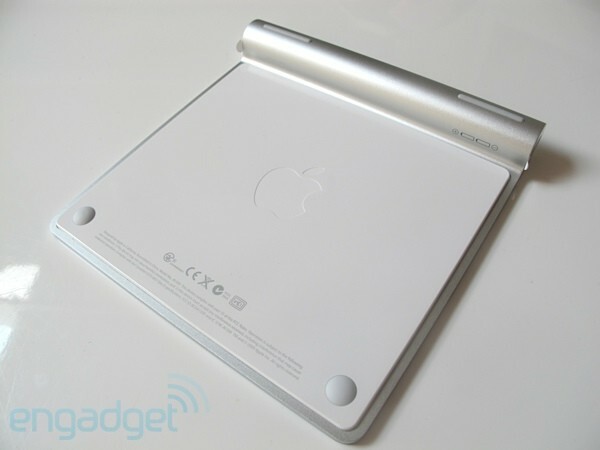 The bottom, plastic section of the pad is protected by small rubber feet, and the battery compartment is accessible through the rounded bit at the rear of the device, as is the power / Bluetooth discover button. The device is considerably larger than Apple's laptop offerings, of course, measuring 5.17 inches long by 5.12 inches wide, giving you a surface area of around 22 square inches (we're subtracting that band at the top). That sounds like it should be a plus, but in execution in almost feels like too much space. Sensitivity and speed for getting around is fine, but often I found myself getting "lost" on the pad when performing more complex gestures like pinch-to-zoom. It's not a dealbreaker, but it takes some getting used to if you're coming off of a MacBook or MacBook Pro. Inside, you've got space for two AA batteries (we're sure Apple would love for you to use its new rechargeable variety), and there's a Bluetooth radio onboard (2.1, presumably), allowing quick and simple connections to most systems. 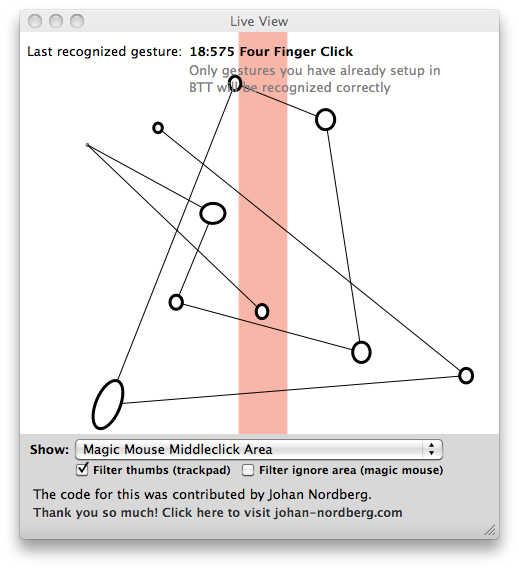 As you would expect, the trackpad is multitouch and responds to gestures using up to four fingers, though the trackpad registered far more touch points in my testing, even up to all ten of my fingers (tested using the third party Better Touch Tool). On a Mac, there isn't going to be a steep learning curve here if you've got a relatively current laptop. 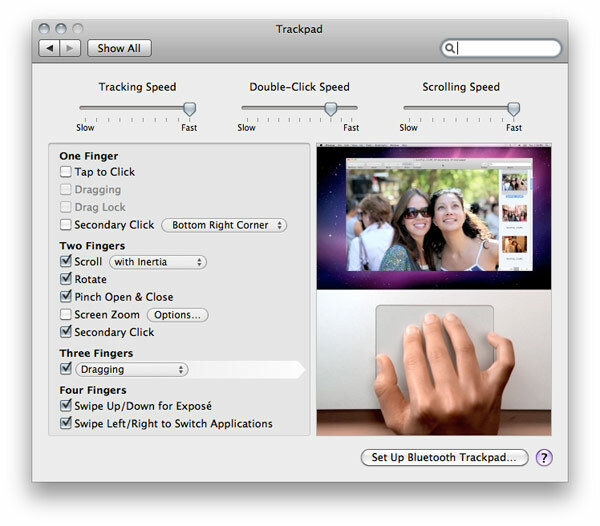 The software which controls and allows you to customize the Magic Trackpad is functionally identical to the trackpad preference pane in OS X. The only notable difference is that Apple has added an additional gesture -- a three finger move that allows you to move windows around or drag objects, though you lose the ability to navigate through photos or files with a swipe. I would have liked to see an option for a modifier key to toggle these behaviors, but as it stands right now, it's one or the other. Besides that very minor addition, you're left with standard Apple trackpad gestures, which include one, two, three, and four finger swipes, as well as multiple combos of tapping, double-tapping, and holding / tapping. As I said, the extra surface area on the pad doesn't always help out when you're trying to work quickly. I honestly might have preferred something a little closer in size to my laptop's pad. I should preface this section by saying that I'm primarily a mouse user -- in fact, I love using a mouse, and I greatly prefer the option of having not only a pointing device, but multiple buttons and a scroll wheel. I don't care for the Magic Mouse, and I haven't been a fan of Apple's increasingly diminished button count on nearly all of its devices. That said, I also primarily use a MacBook Pro and I'm often on the road or in situations where a mouse is just not feasible, so I'm very used to working with only a trackpad. My issues with trackpads aside, using the Magic Trackpad was a fairly enjoyable experience, and while I can't personally envision a time when I completely set aside my mouse in favor of this kind of device, I think it's going to please a lot of people who've been looking for a mouseless experience in a desktop setting. Still, it would have been nice to see Apple go further with functionality on this, possibly following Wacom's lead and including a stylus to allow for other varieties of interaction with the device. We know that Steve is staunchly against styli, but here's a scenario where the marriage of touch and pen input works flawlessly. I couldn't help but think how amazing of an input device this would make for something like that new Apple TV we've been hearing about. In fact, one of the best uses I found for the Magic Trackpad was as a control surface for my HTPC setup. Normally I use something called Air Mouse on my iPhone to control the Mac Mini I have connected to my TV -- but the Magic Trackpad did excellent stand-in work for it during my testing. Of course, there's no keyboard here, and having two devices on the sofa of considerable size isn't exactly ideal, so it doesn't solve every problem. I've mainly focused on Mac use, but the Magic Trackpad is also compatible with Windows XP, Vista, and 7 systems. You can get around well enough with the device on your PC, but it doesn't support anything beyond two-finger gestures like horizontal and vertical scrolling. Basically, most of the charm of the device is lost in the Windows universe, so I can't say I'd recommend it. One other note, if you're dual-booting you've got to use the most recent version of Boot Camp to utilize the full features of the pad, so be prepared to upgrade if you haven't yet (and that means having Snow Leopard on your system). There isn't anything truly magical, revolutionary, or groundbreaking about the Magic Trackpad. It's not the first of its kind, and it doesn't turn our current computing paradigms on their ear. It's an excellent device for those who prefer touch input to mouse or trackball, and it's a solidly built piece of gear that will compliment the uncluttered workspaces of lots of geeks out there. But it's not a game changer or the death knell for our modern day method of interacting with our PCs as some have speculated. In all, at the $69 price tag it's difficult to call something like this a must-have -- it's a niche product for a niche user. It's easy to see that touch input is increasingly becoming an important part of how we interact with technology and the Magic Trackpad does a admirable job of transmuting that experience to the desktop. But at least for this editor, you'll have to pry the mouse out of my cold, dead hands.